about a month before my little trey was to start kindergarden i decided to home school. i thought about all of the things that i loved about kindergarden and i didn't want him to miss out on any of it. i am doing my best to make it awesome. something he will remember, think back to, and smile. i wanted it to be fun. i found these two vintage desks on craigslist. they were old, rusty, and ugly. 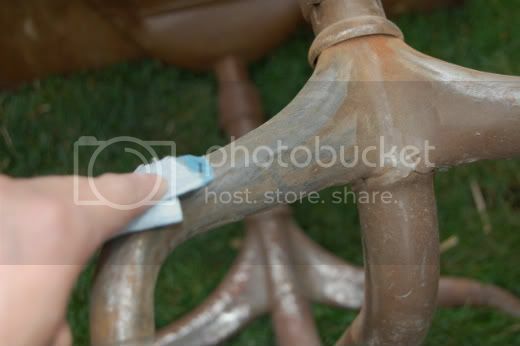 i quickly sanded off any major rust. i knew i wanted to paint these desks but i was worried that eventually the rust would become a problem after time, but i had no clue what to do about it. 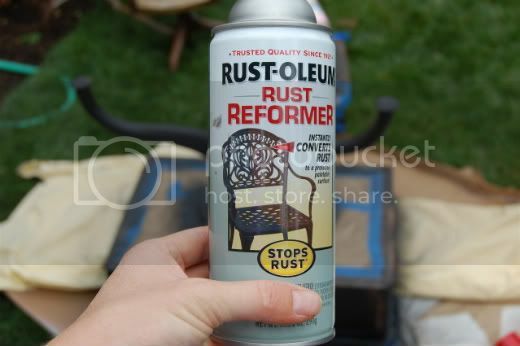 anyway so "i found out" at home depot that if you are wanting to paint something with rust you can first spray it with "rust-oleum" and it will prevent any rust from returning. i taped off anything i didn't want sprayed and then i primed. i sprayed the seat a glossy black. my husband had this great idea to spray the tops of the desks with chalkboard spray paint. it worked great! 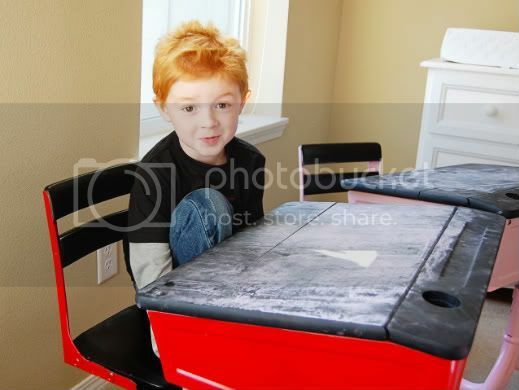 here is trey testing out his chalkboard desk. they have loved these desks! lucy will run to her desk and yell "let's do school mom!" 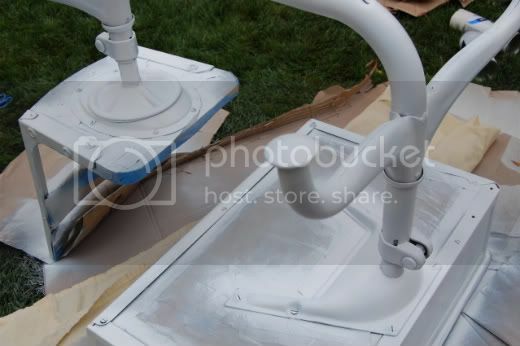 now go to craigslist, find something great and cheap, and spraypaint it. you'll feel better i promise. Those are so cute! I'm going to have to watch craigs list for some! Oh my gosh! Those desks are so so so cute! I want one! Lol. That is awesome! I love how they turned out!! love this idea!!!!!! let me soak in your awesomeness. I forgot to say... I agree 100% with your steps for getting help at Home Depot. I've done that a few times myself and it works like a charm! WOW! Those are amazing! Great job, and thanks for sharing your creativity! Those look awesome - you are so creative!!! You are to funny....great home depot idea! Love the red and and pink...adorable! am in looooovvvveeee with these desks. I now need to find four of them and then I need to find a bigger house so that I would have room for them. oh my heck, those are adorable! Im trying to decide if I want to homeschool. What made you decide to? Great idea to spray paint with chalk!!! Way to go! I love them so much. Why are spray paint and I not friends. I have been trying it out on a few things the past few days and it is with no succsess and no love for each other. Plus it makes my forearm and finger sore:-) You're so talented! Those are perfect - they turned out great! You are way too cute and talented! I got a couple of old school desks from a garage sale years ago and I've never done anything with them! Maybe now I'll spruce them up and put them back on my own garage sale. I just started following your blog and these are awesome! I also loved your steps on the home depot, SO something I would do!! Your too fun! Thanks! you make me laugh...so...hard. love the colors. they look amazing. I have two of these right now...and they need this! Now I have a project to do this weekend!! Thanks so much...you are too awesome. Love it! They look great. The chalkboard paint on the top is a great idea. You are AWESOME with a can of spray paint!!! Love those desks! They are beautiful! And the chalkboard paint was a great idea! Those desks are amazing!! Great job, I am totally jealous and want to do the same thing. BTW~ Taylor just wore one of the flower clippies yesterday we won from you months ago. She wears them all the time... they are sooo cute! Thanks again! 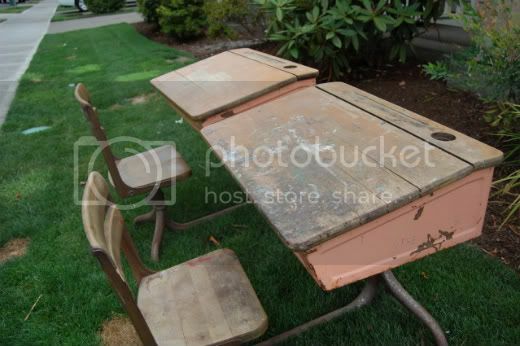 The desks turned out so great!!! Hey I was wondering if you ever got my e-mail. I never heard from you so I wanted to make sure you knew I sent one in case you didn't get it. Ok so I just sent you another one, let me know if you don't get it this time! Oh my gawd those are adorable! i love these desks! they turned out perfect! it almost makes me want to homeschool! great job! Don't you just love spray paint! It might be my best friend! LOL! I was stopping by to let you know that I have an award for you! Just stop by the address below to get it! I had one of these when I was a little girl...mine was pink. I LOVE what you've done with these--so adorable. And you have the funnest tutorials, thanks!! Wow, first of all what adorable little kids. Love that red hair. My husband would have bowed down and worshiped me if I would have had a red haired little one....alas they were all brown haired! Big smile. You did a wonderful job on the desks! Love them. You did a great job on explaining everything too! Have a blessed day! Marvelous transformations! Wait,I think I have one lurky outside now. Thanks for sharing. Those look adorable, like something you'd see in Pottery Barn. These are just adorable and practical too! How creative you are! This is a really awesome makeover! Those desks can be used for years until the kids basically grow out of them! I suggest keeping them even then, they are beautiful now! These are amazing! They are too cute for words! Great job! So cute! I love the chalk board paint on top. And the picture of your kids is just too cute! Congrats on being featured over at Kimbas. I was as well, so come visit my blog when you have the chance. Awesome job! 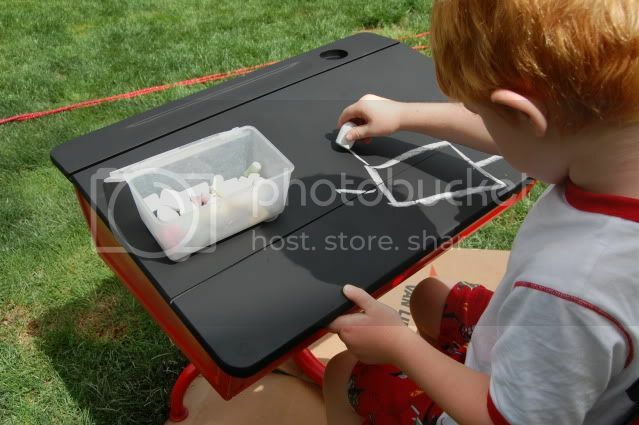 These desks will make kindergarten so much fun for the kids and for you! Very cute! Maybe stencil their names across the front? Happy homeschooling! I just found one of these desks in the "free" section on craigslist. Here to hoping it is still available! You are brilliant! I love the colors your kids chose. And your kids are sooo cute! Love your blog and ideas! Thanks! They turned out so cute! How fun that each child has their own personalized desk. Love it! Those are super duper cute! Man I wish I had that kind of craigs list luck! Awesome job! 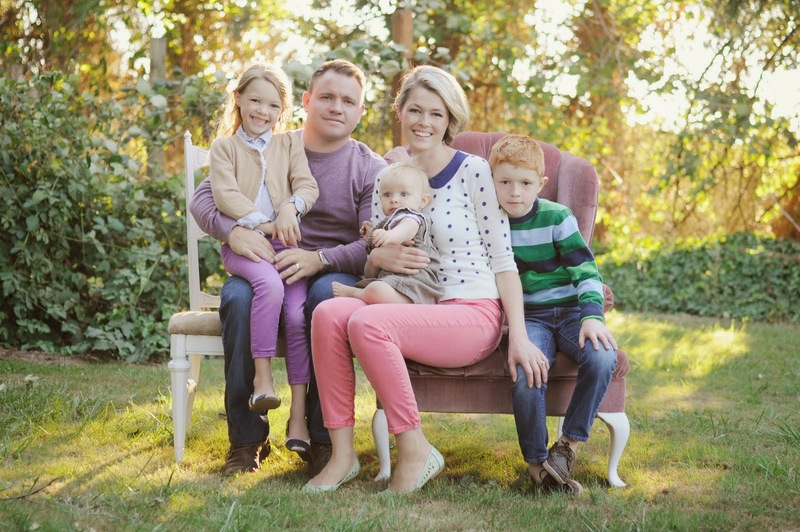 I just found out about your blog from my SIL, and I must say that you are so extremely talented!! Fabulous refurb projects, adorable photos, and easy-to-follow instructions. Thanks for sharing your talents!! Ohhh...what a fabulous project! I love how you refinished these vintage desks for your kiddos! Adding the chalkboard paint to the tops of the desks...genius! I know that your little ones will enjoy these for a long time! Love how they turned out...fabulous job!!! Your kids seem to be about a year ahead of my youngest two. I have a 9 year old, a 4 (almost 5) year old and a 2 (she'll be 3 on the 7th) year old. 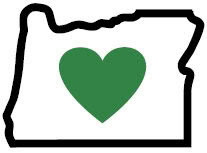 Our oldest is in public school and the middle child is in preschool at our church, I'm really thinking of homeschooling since schools in our state are pretty bad. Thanks for the great idea, I'll be scouring craigslist for something like this. LOVE LOVE LOVE your blog. I love those! Great idea. Spray paint is my best friend lately. Love these!! I bought a "vintage" desk . . . or maybe retro - the kind we grew up with, anyway . . . that I bought for $2. Then I found out it has a bad word scratched in the top!! So, I have to spray paint it. Honesty time: Is the chalkboard a pain to keep up with? Does it make a major mess on the front of their shirts or anything like that? It sure looks cool, and I'll paint the top black at the very least. And, I use the same steps at Home Depot (or anywhere for that matter!). Glad to see that others are using the talents God gave them!! Very cute!! I truly believe that there's nothing a little spray paint can't fix!! These are so Pottery Barn Kids but on steroids! Brilliant. I love the pink and the red together....you are amazing!! Oh my, I want these in my house so bad. Fabulous!!! Beautiful. Love the steps on how to get help at Home depot ( which Im guessing is a big hardware type place?) they are the sort of steps I use! I just so happen to have one of these in my storeroom right now. :>) Love the chalkboard paint - looks like it's well used and well loved. I linked to this on my weekly roundup - post is here. Thanks!! I never cease to be amazed at the things that can be chalked on! Excellent job,the kiddos look very pleased. The desks are darling and I love the "out of his league" part of your tutorial. There is a much easier way though, and you don't even need to get out of your pajamas or waste good perfume. It is called "GOOGLE". I just bought an old school desk for my daughter this morning from a consignment store. I knew I wanted to paint it and found your blog when I searched for 'refinish child's school desk'. Thank you so much for the information. Very cute desks, and blog, by the way! Thank you so much for the tutorial! A friend of mine found the same desk for us on the side of the road and I can't wait to follow your steps for ressurecting it! We have bright blue walls, kelly green curtains and I'm leaning toward that red for the metal:) Thanks! Looks very good, indeed those are some really old models. Glad I ran into this. I purchased the exact same desk for $20 at an antique store and was finding ways to flip it. 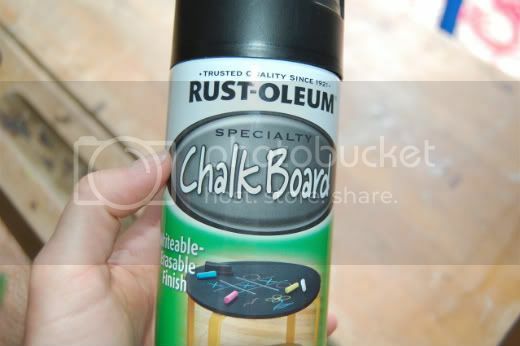 I didn't know that there was such a thing as Chalkboard paint. I was going to purchase some chalkboard material and glue it on top of the desk. But I may try that paint instead. 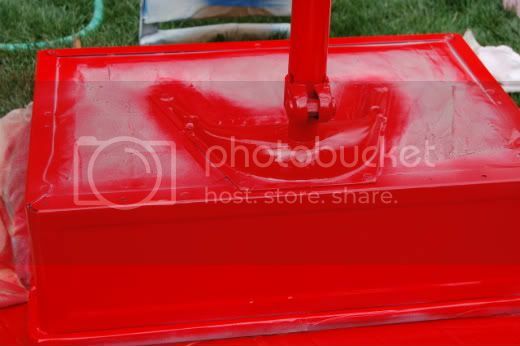 Did you use the rust paint to remove all the old paint or did you spray it first, then prime it and use the color paint? How did you prep desk top? I want to reprise mine since my grandson has,outgrown it. My dad found mine in the trash, score! The wood is amazing as it is, it was used in the 30's, 40's and 50's by the etchings into the wood, which I absolutely love, on one bottom side of the desk it says I love Elvis lol scratched into the wood. I don't want to change its character, other than a good sealer but I want to use it as a hall planter. Or photo shelf, etc Anyone have any ideas how to level the wood top without changing the integrity of the desk, meaning nit a,whole lot of drilling into it yet I want it to be level? ? Any ideas welcome.